Sudoku puzzles are great if you're looking for a tricky brain teaser. Sudoku is one of the most popular puzzle games of all time. The goal is to fill a squared 9×9 grid with numbers so that each row and column contain all of the digits between 1 and 9 without clashing with one another. 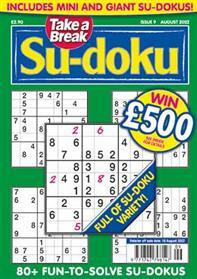 Our Sudoku puzzle magazine, Take a Break's Su-doku, contains 80 great sudoku puzzles along with innovative variations, like the ever-satisfying and very popular 16x16 grid, to keep boredom at bay for hours on end. Take a Break's Sudoku features over 70 sudoku puzzles suitable for all abilities. It includes the original 9x9 grid plus the very popular 16x16 that'll keep boredom at bay for hours.